Turn up the shine on your tires! 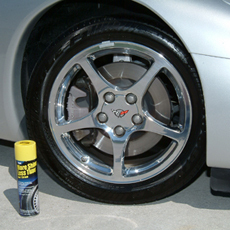 More Shine Tire Finish is an easy-on aerosol tire dressing that makes tires look brand new in just seconds! Spray and walk away. More Shine Tire Finish won’t streak or sling. Your tires will have a satin, black finish for weeks! More Shine Tire Finish is not a messy foam or drippy liquid. This easy-to-use aerosol needs no wiping. Professional detailers and do-it-yourselfers will love how easy it is to give tires a dark, satin glow. The other leading brands don't last because they're made with water and surfactants (soaps) that evaporate and wash off easily with water. More Shine Tire Finish REPELS water and waterborne dirt and won't "brown" tires. This Tire Shine is clear & non-greasy. More Shine Tire Finish contains no harmful petroleum distillates. Apply 1 coat for a satin finish, 2 coats for high gloss. Application takes just 15 seconds per tire, won't harm wheels or paint, and provides excellent UV protection. Get More Shine in Less Time with Stoner More Shine Tire Finish Aerosol! Pair this product with our Wheel Shield for dynamite results! This item cannot be shipped to California, New Hampshire, or Utah.